Stacking Student Chairs Add Color To Your Classroom And Offer Color-Coding Opportunities For Learning Stations And More. The Four-Leg Base Features The Strength Of Heavy-Gauge Tubular Steel. Smooth Polypropylene Shell And A Comfortably Contoured Waterfall Seat Front Allow Easy Cleaning. 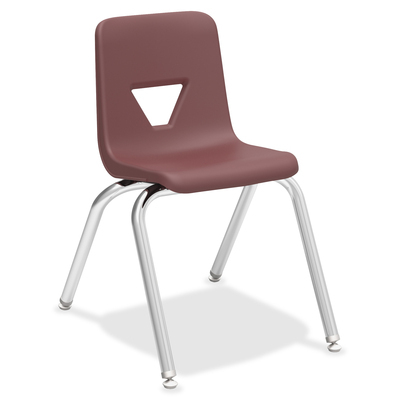 Seat Height Is 16" And Is Typically Designed For Children In Second-Grade, Third-Grade And Fourth-Grade. Chairs Stack Five High For Convenient Storage..
Stacking Student Chairs Add Color To Your Classroom And Offer Color-Coding Opportunities For Learning Stations And More. The Four-Leg Base Features The Strength Of Heavy-Gauge Tubular Steel. Smooth Polypropylene Shell And A Comfortably Contoured Waterfall Seat Front Allow Easy Cleaning. Seat Height Is 16" And Is Typically Designed For Children In Second-Grade, Third-Grade And Fourth-Grade. Chairs Stack Five High For Convenient Storage.